Online media, technology and advertising behemoth Yahoo! Inc has exited two of its investee companies in India, both online firms. Earlier this month, it exited Consim Info Pvt Ltd, the company behind matrimonial classifieds sites such as BharatMatrimony.com and Community Matrimony, as well as real estate portal Indiaproperty.com. Now, Yahoo! 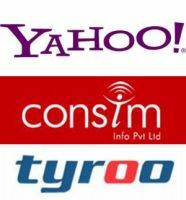 has exited Tyroo, which was one of the earliest online ad networks in the country. Consim Info: Yahoo! had invested in Consim in 2006, in the first round of investment raised by Consim. It has now sold its 12 per cent stake in the company to Bessemer Venture Partners, Mayfield Fund and Canaan Partners India, for about 100 crore. Incidentally, Mayfield Fund and Canaan Partners India are the existing investors in Consim. The stake sale was a direct share sale between the investors and it is learnt that no capital has been raised by Consim Info. The exit valued Consim at $190 million (Rs 900 crore). Murugavel Janakiraman, CEO of Consim Info, confirmed Yahoo! 's exit to VCCircle but did not discuss the valuation. Consim runs over 350 portals in all, including its flagship BharatMatrimony.com and various sites under the consortium Community Matrimony. It has recently launched an e-commerce site Matrimonygifts.com. Tyroo: Yahoo! has sold its 35 per cent stake in Tyroo to Xplorer Capital, a growth equity fund focused on emerging markets. Xplorer was established in June 2011 by Keith Nilsson, who was previously a senior vice-president of Yahoo! 's global initiatives and headed its emerging markets division. It has been confirmed that Yahoo! has exited Tyroo but an official statement is yet to arrive. In July 2007, Yahoo! Inc acquired 35 per cent stake in Tyroo Media Pvt Ltd, which was launched by Smile Interactive Technologies Group (Smile Group). The investment signified Yahoo! 's increasing focus on Indian online advertising networks and helped it reach out to small and medium-sized advertisers and publishers in India. Tyroo connects publishers with advertisers through a self-serve technology platform and has added 100 new customers over the past year, including Michelin and Swift Tourism. Other key clients include Airtel, General Motors and Aircel. Additionally, The Times of India reports that the Internet firm is also planning to sell its stake in a third online firm â€“ Chennai-based Info Network Management Company Pvt Ltd (Inmac), which runs Callezee, a phone search service. Inmac/Callezee: In late 2008, the Dutch subsidiary of Yahoo! acquired 30 per cent stake in Inmac. Incidentally, Xplorer Capital had also invested in Callezee. The service currently provides information to callers via fixed or mobile phones in 17 cities across India. Attempts to reach T.S. Narayanaswamy, CEO of Callezee, were unsuccessful. The past few years have not gone well for Yahoo! Inc. For one, it has still not appointed a CEO after Carol Bartz was fired. Yahoo! 's recent financial quarter was also flat, with search advertising and non-premium online display ads falling short of market expectations. Net profit fell to $293 million while net revenue stood at $1.07 billion. The company's interim CEO Tim Morse had said that non-premium ad sales faced an 'underrun' in the quarter. Softbank, the third largest telco in Japan, has also announced that it will sell its four per cent stake in Yahoo! to invest in Bengaluru-based mobile ad network InMobi, which had recently raised $200 million. Talks of sale of Yahoo! to Microsoft, AOL Inc and Alibaba Ltd have been doing the rounds for years now. Reuters reports that various investors, such as private equity firms Silver Lake Partners, Providence Equity Partners, Bain Capital, Hellman & Friedman, Blackstone Group, and KKR, are also interested in a deal with the company.